Welcome to this 40 hour CPD course for Yoga Teachers, bodyworkers, wellness practitioners & anyone with an interest in Restorative Yoga. All are welcome to apply if they have at least one year’s yoga practice. This Restorative Yoga Training Syllabus has been available to view online since 8th January 2019. The course content below was approved and listed by the Yoga Alliance UK on 17th January 2019. Restorative Yoga facilitates rest & repair in the systems in the body and promotes healing, growth and rejuvenation. To be able to rest fully is vital for optimal mental, physical and emotional wellbeing. Society needs Restorative Yoga Teachers! Learning to teach Restorative Yoga effectively, knowledgeably, safely & with artistry will allow you to reach a wider scope of student and make a difference to more people. It will also give you more practical tools, inspiration and motivation to practice radical self-care. The rapid acceleration of technology & the onslaught of continual stimulation / information means that the type of electrical activity saturating the brain leads to heightened (hyper) anxiety and altered arousal responses, causing more fear, anxiety, depression, stress, frustration, mental cloudiness and diminishing higher, intuitive-transpersonal mental functioning; in other words, a shutting down of our higher intuitive abilities and spiritual awareness. Vigorous Yoga styles have tended to dominate the modern Yoga movement with fantastic benefits in their own right. The pace, exercise, stimulation & activity inherent in these styles means that the electrical activity in the brain may sometimes remain in an excited state or partially excited. Where are we offering our students the chance to develop the art of going slow? The capacity to truly switch off? To become deeply quiet? To soften? To experience the medicine of ‘not-doing’? To taste the tonic of profound surrender? Where are we offering our students brains and bodies the chance to recover, to step OUT of the hyper-charged feeling of having to be ‘on’ all the time? It is my firm belief that Yoga Teachers have the opportunity to counter the fast-pace conditioning that is causing so much harm to our tired bodies and frazzled minds. We can help steer the collective consciousness towards a radically slow, more mindful way of being. Here is a blog I wrote last Winter about Restorative Yoga as a radical and political act. Please note, the yoga events listed in the above blog have now passed. 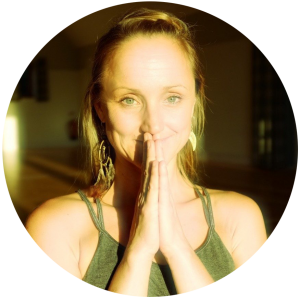 For active Restorative Yoga Workshops with Emma, click here. A 40 hour Level One training course for Yoga Teachers to train in the art and science of teaching Restorative Yoga. Movement teachers and wellness practitioners are welcome to apply if they have at least one year’s yoga practice. Led well, Somatic practices are an excellent way of beginning a Restorative Yoga Session. Rather than going directly from ‘doing’ to ‘not doing’, these exercises create an embodied, felt sense of grounded safety and security. This puts people at ease and creates an excellent platform for beginning the journey of relaxation. Somatic exercises promote gentle, mindful self-connection so that guests can contact ‘presence’ within themselves before moving into the Restorative Session that follows. This can help to promote self-regulation & attunement and can diffuse nerves, anxiety, fear of the unknown & dissociation. This is such an important knowledge base to have as a Yoga Teacher since many people who come to our classes may be (and in my experience often are) struggling in ways that cannot be seen or known to us immediately. To have an understanding of the impact of trauma, how we can become attuned to notice and support people if it shows up in class, how we can be attuned to notice and support ourselves when it shows up in class or in you (!) and so how we can best serve ourselves and our students by educating ourselves about trauma and triggers. Find your workshop signature (Tutors: Emma Cole – Degree in Dance & Vocational training in Physical Theatre & Ashley Ramsden – International Storyteller and Sacred Poet). Receive expert guidance, practice & tuition around delivering words in yoga sessions: Tone, intonation, diction, vocal texture, connecting voice to spirit, projection without shouting, pacing, pause. Find the sweetness & the sacred within yourself and bring this to the table with an artistry that delicately elevates your offerings rather than distracting from them. Sangha (like-minded community) & Sadhana (spiritual routine that is alive with authenticity & intention) generates a potent space for inner growth & absorption. Together we will sit, breath & connect to ourselves and our group every day with mindfulness as we embark on the learning of knowledge & information, that our learning may be integrated into all aspects of our being. This course is a radical opportunity for professional growth, personal artistry & potent self-development! It contains valuable & enriching professional content, not normally included in Restorative Yoga Teacher Trainings. As well as a sturdy foundation in technical knowledge & teaching skills specific to this style of Yoga, this course also shares the humanistic, holistic & artistic ingredients that have given Emma’s Restorative Yoga Sessions an appreciated, well attended and highly regarded signature. It’s not just about what we know, it’s about how we relate, how we support & acknowledge our students with authenticity & integrity and how we take care with the smaller details. Qualified yoga teachers (200 hours minimum with at least 1 year teaching experience) who have either recognised their own need for Restorative Yoga and/or who want to guide others they teach – either in specifically tailored classes or workshops. Trainee yoga teachers, therapists & anyone with an interest in or passion for Restorative Yoga is most welcome to attend this immersion course for self-care and self-development and to run not-for-profit sessions to friends and family. Applications will be considered on a case-by-case basis according to relevant experience. At the end of the course, an assessment will be set for those who are wishing to gain certification. This will be a written exploration of a restorative teaching practice designed by you along with a ‘reflective practice summary’ post-teaching it to a case study individual or small group case study. This will include observations about what is alive for you in relationship to the class you led. The full assessment criteria will be set out during the immersion. Certification is granted on submitting the assessment within three months of the last date of the attended course. If the assessment is not up to pass standard, then constructive feedback will be given and one more submission (within one month) will be allowed. Those who do not pass will then have the option to redo the course at 20% discount. On completion of the course students will receive a certificate of attendance which can be used for CPD points e.g. Yoga Alliance CEP and YAP, British Wheel, General Osteopathic Council. Please check with your Professional Body for details..
Teachers wishing to receive an RY teaching certificate will complete 10 hours of extra-curricular assignments. Everyone is welcome to partake in the assignments & assessment for the purpose of integrating personal learning from the course. Please ask if you would like to arrange payment in parts. 40 Hours: 30 Teaching hours, 5 hours reading, 5 hour home practice, reflection and journalling. Emerson College, Forest Row, East Sussex, RH18 5JX. The College is 45 minutes drive from Brighton and is easily commutable if travelling by car. The College is 10 minutes by taxi from East Grinstead Station. Emerson college is a beautiful rural site – a stately home with modern teaching facilities, surrounded by fields, meadows and woods. The college is renowned for land-based studies, therapeutic education and the arts, including fantastic sculpture and story-telling. What makes The Float Spa an award-winning health and wellbeing centre in Hove isn’t just the fact we offer floatation, yoga, massage, chiropractic care, nutrition advice and a whole host of different workshops under one roof, it’s our outstanding customer service and serene, friendly atmosphere. For those of you travelling from further afield, there are a number of affordable local inns and hotels (as well as eateries and supermarkets). Ask me for further details. Emerson accommodation is dependant on the number of people booking onto the course. If numbers are large enough, we will open up booking to stay at Emerson College itself which would also include dinner time meals. The additional cost of this would be £200 (3 x nights accommodation, 3 x dinners, 3 x breakfasts) made payable to Emma Cole Yoga and would be separate from the training course fee. Click the ‘Apply Now’ button, complete the form and I will be in contact to answer any questions and approve the application. On approval I will supply you with a link to a Booking Form and details for the deposit to secure your place.